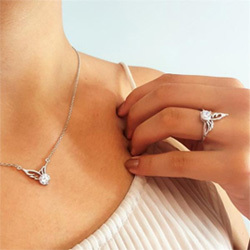 This delicate necklace, accompanied with a circular pendant and adorned with a beautiful angel wing provides a subtle way to commemorate the loved ones we have lost, yet they will hold a special place in our heart forever. The necklace I ordered was perfect. I have gotten many compliments on it. You can bet I will be sending business your way. The necklaces I have purchased from you are absolutely beautiful. The messages are so meaningful, I suppose you have lost someone that you dearly love. I can't believe how they touch my heart. I CAN'T SEND A PIC, IT WAS GIVING AS A PRESENT BUT IT WAS PERFECT. I bought this for my sister; her twin passed away unexpectedly 3 days after Christmas. She was so happy with it because she is always saying that to her twin! I absolutely love it! The minute I opened it I put it on and haven’t taken it off. Beautiful!!! Absolutely love it. Thank you. Bought it in memory of my sister. I purchased this necklace as a gift for a friend who recently lost her Mother. The sentiment and angel wing will serve to remind her that her Mother Is always with her. The chain is long and the charm seemed larger in the pictures, but overall stunning piece! I bought it for my other half who just lost her sister made her emotional she loves it. Thanks might be getting another. Everyone experiences death in different ways. For my sister-in-law it's little signs loved ones being near. This will give her goosebumps! I bought it for a gift for my sister-in-law. My brother passed away and I’ve heard her say the saying I chose numerous times. She loved it. This was a gift for someone. She absolutely loved it. I purchased this for my daughter so she hasn't gotten it yet but I love it........it's absolutely perfect & it's going to make her smile.......we say that same thing all the time. this was a very special necklace since my husband passed away. It is precious and so pretty. Well done! Looks just like it appears in the picture. Prompt delivery. It's beautifullllll I keep it close to my heart. I haven't wore the necklace yet I am having his name and date of death engraved on the back side of it. I love my necklace. I haven’t bought jewelry for myself for awhile but I’m glad I did. I purchased this necklace for a very close friend who recently lost an 11 year old little girl whom she was VERY close with. The day sweet Cayde passed away, I saw your ad on Facebook and new I had to get this necklace for my friend. I mailed it to her yesterday, but she's flying out tomorrow morning (9/7/18) to Cheyenne, Wyoming for the service for sweet Cayde, so she won't get her card and necklace until she returns on Sunday. I know she's going to love it. It's beautiful and perfect for her. This was a gift for a very dear friend, who recently lost her mother. Before she passed away, her mom told her she would be watching her and sending her messages. Needless to say, it brought a tear to eye - a happy tear! I bought this necklace for a dear friend who has lost her husband/friend. I’m glad to report that not only did she cry, she loves it and is wearing hers. My daughter loves it! She lost our first granddaughter in a horrible head-on crash, and this necklace is a great reminder that we will meet again! I absolutely love this necklace. It has adjustable chain and the actual charm is big so that you can read the writing on it! I expected it to be smaller, but am so happy that it’s not! So nice to buy a product that exceeds your expectations!!! Love it and will order again! Love this necklace. Great quality and love the saying. Had been looking for a Birthday gift for my mom. This was exactly what I was looking for. I love it and can’t wait to give it to her. I really love it !! It so pretty !! !❤ thank you so much!! I'll be ordering again soon. I am sharing this one with my daughter to remember her sister and her father that have both recently passed I know she will love it. I Love this necklace and have ordered another one! These were Christmas gifts and everyone loved them! My son died when he was 13. Every time a street light goes out we smile and say "Cortney, We know that was you." This necklace is perfect for me. I really love this piece. It means a lot to me. It is a reminder that my love ones are watching over me. I have on my rear view mirror as l am in traffic so much and like my guardian angel looking out for me. It was perfect! For a daughter that last her Mom ! I lost my mom in June. Her birthday was November 17th. I saw the ad for the necklace on facebook two days later and purchased it in memory of my mom. Every time I wear it I think of her and it's feels like she's with me. I bought this necklace for myself as it reminded me of a very special man who graced my life for 13 years. Many's the time I've expressed this exact sentiment while thinking of him. Thank you for giving me a tangible way to express how much I miss him. Absolutely stunning. My grandma is in love with it. I bought this gift for my sister who recently lost her husband. I know she'll love it! Love your products. Make great gifts. These have a nice weight to them and are comfortable to wear. Be prepared because people want to know where you got it from. Love all of your products! The items were beautiful! The only thing I wished was that the necklace chain was a little different but I can still wear it. For me the words are hard to read and I wish the medallions were just a little bigger but all in all I love them and glad I purchased them! I wear them every day! There was a mix up with my initial order. I emailed and it was rectified immediately, thank you . The recipients of the gifts were pleased. Beautiful set. Quite amazing!! Thank you! !